Choosing to study at Beaulaz is one of the best decisions I could have made. The tutor Sarah was completely supportive throughout every step. She pushed me and my friends, and was always around to help when we were struggling. If it wasn't for Sarah we would have given up. She is so professional and understanding. We were able to overcome language barriers and learn skills that we absolutely enjoyed. I loved that we had smaller class groups; it enabled us to really build the best relationship with our teacher. Coming to classes in the Beaulaz Hounslow branch made a Thursday something to look forward to. I made such close friends here and I wish I could re-live the experience all over again. 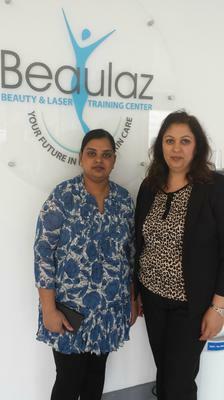 I studied an NVQ Level 3 Beauty therapy General course at the Beaulaz Slough branch. My tutor was Sarah Hudson. I think that she taught the course extremely well, she emailed all the information for the course and was very helpful in class. The quality of the course was good. They covered the basics needed to get through a Level 3 in a short time, which I found impressive. What I particularly liked was that Sarah the tutor was great; she was very good at explaining things and dealing with the class. She had a very good manner and patience. Improvements that can be made in Beaulaz are to provide abit more A & P in class. They can also improve the couches. I would still definitely recommend this place to others. Sarah was wonderful; she was very helpful throughout my course. I always felt supported and knew that she was there for me. It was great to know that she was always available to get hold of; she was free to email and answer any questions. Sarah was an excellent tutor too. I felt that everything was well explained. I travel from quite a distance just to attend my courses with Beaulaz. I live in Ilford but it was worthwhile, I initially chose to come back to Beaulaz after studying for a Level 4 qualification with the other tutor Kay. I enjoyed myself very much. I would recommend this Level 3 course and all Beaulaz courses too anyone. I feel that anyone from any background can go for a beauty course here because if any work is leftover you can return to do it on another date and they reassess you. The Slough location was good and easy to find. The college was good and I have no complaints. Beaulaz is excellent! I have been studying for just 5/6 months and am so happy to know that I already have certification for Level 2 and my Level 3 is on it's way! I attended lessons in the Hounslow branch and found it was convenient for me to get to as I live nearby,and found it easy to travel here by bus. I found Kay to be a very good teacher, I also found the college to be welcoming. I found all my classes comfortable, I made many friends whilst studying here. I did the Level 3 in Beauty Therapy, My favorite part of the course was all the practical experience. Especially when doing the body electrical treatment. I now feel so much more confident conducting treatments and really knowledgeable. Once again I think Kay is an amazing teacher. I found all the advise she gave me and chances to conduct practicals really helped me develop my skills. I never felt that anything was ever difficult because Kay would always help me to find clients, develop a good client relationship and conduct everything with my best efforts. I enjoyed doing my course here so much that I would love to work within the Colaz salons which are also owned by Beaulaz. My next plan is to do Level 4 Laser course as I have already worked with an IPL during my Level 3 course, so want to advance my qualification. I thought the course at Beaulaz was convenient as I have two small children. Being held just once a week, it fits in perfect around the children. Sarah was very helpful; she bonds with you as a teacher and as a student too. It is because she gives a lot of support and help after her demonstrations. She came down to my level as a student on many occasions and made me feel really comfortable. I think that the Level 3 was very interesting; it is so hard to find this same range of coverage within other colleges. I really enjoyed my time here. No matter if you are ill and have missed a class, they are fully supportive. They help you to get back up to speed. It really feels as though Beaulaz wants you to learn and achieve everything just as much as you do yourself. This Slough College is right on my door step, very convenient. Even if the college had been located further out, it would be well worth the travel. I would recommend Beaulaz to others, as there is so much support even though it is a fast track course. You never feel rushed to complete things and all the course is broken down well between the theory and practical for each individual module.